Saturday September 19th will be an Open day at the Norwegian University of Life Sciences (UMB). From 10:00am to 15:00 pm there will be a variety of fun, educational and entertaining activities for the entire family. 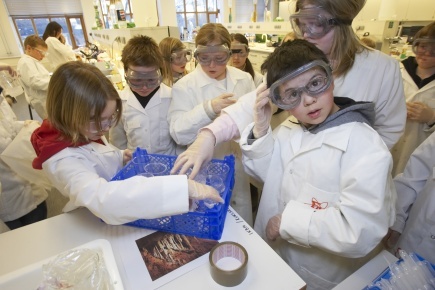 Children of all ages will participate in exciting experiments. We also invite to presentations by leading scientists. We offer activities throughout the campus. All activities in the program during the day are free. 11.00 Do we dear to enter the bear-forest? 11.30 Removal of trees on your neighbors’ property: A small glimpse into the issues of property rights. 12.00 Renewable energy- Environmentally friendly? 12.30 Emission of greenhouse gases – Why reduce at home when it is cheaper to invest in CDMs abroad? 13.00 The reason why fruits and vegetables are good for you. 13.30 Norwegian cow and pig in the world-class. All events will take place in Tivoli, Stein Bie Room, 2nd floor. 11.15–12.00 og 13.00-14.00 Virtual travel to Tanzania, visit a farmer, ask about biofuel. More activities will take place at the other Departments at UMB, however, these will be held in Norwegian. Please see http://www.umb.no/aapendag for further information. 10.00-15.00 The cantina in the Economy building will be open. 10.00-15.00 Information stand at “tunet” about the Open day and study options at UMB. 10.00-15.00 Exhibition in the library- UMB and the library throughout 150 years. 10.00-15.00 Nature trails at campus. Start from 10.00 to 14.00. 10.00-12.00 The band “Ås Blæst’n” plays from 10-12. 11.00-14.00 The association ”Hunkatten” arranges games at the lawn in front of the Clock building. 11.00 A walk amongst UMB’s art treasures. Meet in front of Aud Max. Watch and learn about different artworks created by Nesjar, Sitter, Videnfalk, Boge Berg and Elmgren and Dragset . 11.00-12.00 The plants in the park. Meet at “Universitetstunet”. 12.00 Forest walk among foreign trees. A guided tour in Arboetet. Meet at the entrance of Nordskogen (see sign from “tunet”). 12.00–13.00 Historical park walk. Meet at “Universitetstunet”. 12.45 A walk through UMB’s 150-year long history. Meet at “Universitetstunet”. 13.00–14.00 The plants in the park. Meet at “Universitetstunet”. 14.00 The park and the buildings. Meet at “Universitetstunet”. 14.00-15.00 Historical park walk. Meet at “Universitetstunet”. As the distances are quite large at Norway’s largest campus, a very special “train” (Tøffe-toget) will bring the visitors around the campus between the different departments and associated activities. The Student’s union invites you to a theatre play in Norwegian called "Arvesølvet". Two performances will take place, one at 18.00 and another at 20.30, which also includes a concert. Tickets can be booked and bought via www.billettservice.no or at the door. More information can be found at www.student.umb.no.